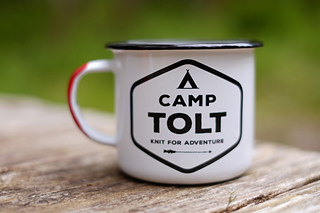 This pattern was designed in collaboration with Tolt Yarn & Wool for their summer Camp Tolt pattern series. 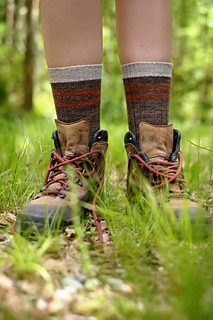 I’ve been out hiking almost every weekend this year and it got me longing for a well thought-out boot sock. 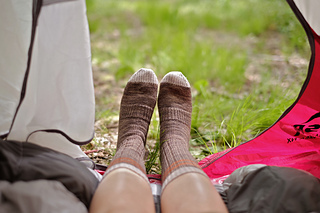 I designed these socks to have a traditional look and to include all sorts of great details to make them comfortable, durable, and functional. Reinforced heels and toes mean they’ll stand up to lots of trekking, and ribbing around the ankle and across the narrowest part of the foot offers a good, elastic fit. They’re worked at a dense gauge for a hard-wearing fabric. 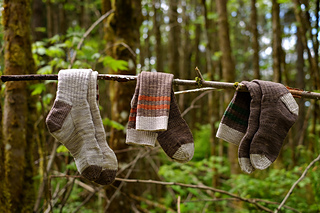 They’re also a bit taller than standard to go with your favourite hiking boots. 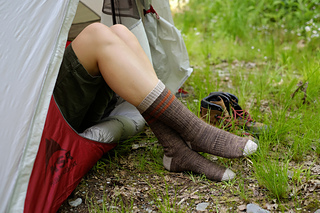 The pattern is written for five adult sizes with both straight and shaped calf versions, so knit these up for you and your friends, and head out on an adventure! US #0 / 2.0 mm set double pointed needles, 32 in / 80 cm circular needle for magic loop method, or 2 circular needles; use preferred small-circumference method.